The spinal cord is surrounded by tough fibrous covering called the dura. 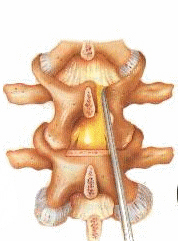 The spinal cord and dura are located within a bony canal created by the vertebral column. Tumors can arise in any of these spaces and are grouped according to location. 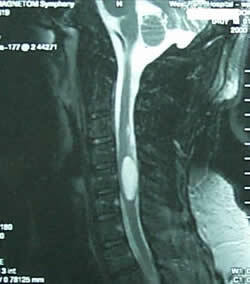 The location of the tumor can be identified on imaging studies, such as MRI, of the spinal column. In general, extradural lesions are the most common representing 60% of all spinal tumors, with the majority originating from the vertebrae. Intradural-extramedullary tumors represent 30% of all spinal tumors. Intramedullary tumors are uncommon spinal tumors (10% of all spinal tumors), and occur most often in the cervical spinal cord. These are often associated with a dilated fluid cavity called a syrnix. The most common extradural tumors are metastatic – that is, they spread from some primary tumor site (like lung), through the blood stream, to the bones of the spinal column. The most common intradural-extramedullary tumors are meningiomas and schwannomas. Meningiomas arise from the dura itself and a more common in women. Schwannomas arise from the lining of nerve roots. 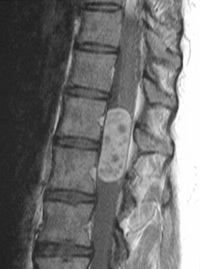 Patients with spinal tumors typically present with back pain at the level of the lesion. The symptoms can be of long duration because these lesions grow slowly. The pain tends to be worse at night. Patients may develop weakness, numbness, difficulty walking, and bowel/bladder dysfunction. 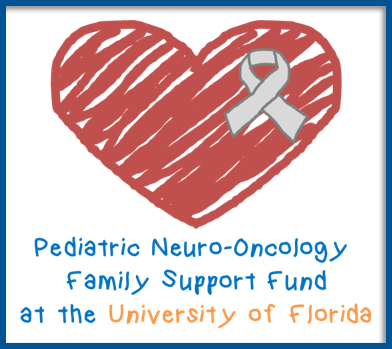 A detailed neurological physical examination can localize the level of the spinal cord tumor. Individual muscle groups are tested for strength to determine any signs of weakness. Sensation is tested to evaluate for any signs of numbness. Reflexes are tested at the elbows, hands, knees, and ankles for any abnormalities. The diagnostic test of choice is an MRI (magnetic resonance imaging) study with and without contrast. Surgery is often performed on spinal tumors in order to obtain tissue for diagnosis, relieve pressure on the spinal cord, and stabilize the spine if necessary. Typically the patient is put in a prone position and a laminectomy (removal of bone overlying the spinal cord) is performed after radiographic confirmation of the appropriate spinal level. The dura is exposed at the correct level and opened if the tumor is intradural. Using the intraoperative microscope, the tumor is then excised and sent for pathological examination. Surgery alone is usually curative for benign tumors. Metastatic tumors and some gliomas are also treated with postoperative radiation therapy.